Did you know that your HVAC system has a huge impact on the environment? With the hot and humid temperatures here in New Braunfels, your air conditioning system is likely working hard to maintain comfortable temperatures throughout your home. But did you know there are several Eco-friendly ways to make your air conditioner run more efficiently, thus saving you money on your monthly bills, creating a comfortable atmosphere in your home, all while helping the environment? 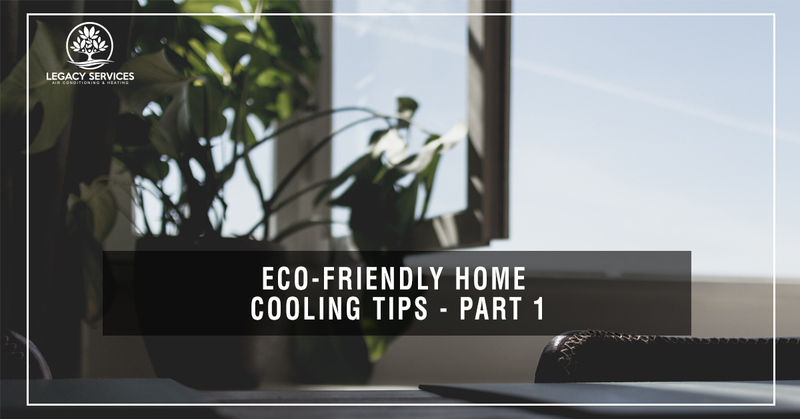 In part one of our Eco-friendly cooling tips blog series, we’ll share some amazing energy-saving tips with you to help reduce your energy usage, decrease your energy bill each month, and keep you and your loved ones cool. Please continue reading below to learn some helpful air conditioning tips. Installing energy efficient window treatments such as blinds, drapery, and shades can help maintain cool temperatures in your home. Blinds, whether horizontal or vertical slat-type, are an effective window treatment for reducing solar heat gain within your home. Blinds also allow you to control how much light enters a room, so you don’t have to completely block out the sun if you like the natural lighting. What’s more, exterior blinds are an affordable way to add an extra layer of solar heat protection. Hang them in front of windows and home entrances for an added solar barrier. Curtains on the other hand, come in a variety of fabrics that can protect windows receiving direct sunlight. Some studies suggest that medium-colored drapes with white plastic backings, when closed, can limit heat entering your home by about 30 percent. Window shades are a simple and affordable way to keep your home cool while reducing energy costs. Installing dual window shades—light-colored on one side to reflect heat, and darker on the other to absorb heat—is the most cost-effective shade because your house will be protected during all seasons. Just make sure the lighter side faces outward during the summer to reflect the sun. Awnings add personality to any home’s exterior, while also providing an excellent defense against solar heat gain, especially in areas with significant sun exposure. Some studies suggest that awnings can reduce heat generated by the sun by upwards of 65 percent? And if you think awnings are all made of metal or canvas, think again. Awning manufacturers today use synthetic fibers like polyvinyl laminates and acrylic which are not only water-resistant, but more cost-effective and attractive. So not only are your energy costs reduced, you can also spruce up the exterior of your home. Reflective window films provide efficient protection from solar heat gain, reducing energy costs by upwards of 30 percent. High-quality window films reduce heat by controlling how much heat penetrates through windows, essentially helping to maintain a comfortable room temperature. What’s more, you can choose your desired style to match your home’s decor. Window films are affordable and easy to install, and will definitely help reduce your energy costs while keeping you and your loved ones cool without having to blast your AC unit at maximum strength. Programmable thermostats regulate the temperatures in your home whether you’re there or on the go, which can significantly reduce your home cooling costs. Additionally, you won’t have to remember to turn your AC up or down at different times throughout the day. You can install them yourself or call in our HVAC experts to install programmable thermostats for you. We at Legacy Cooling and Heating Services hope you have found these Eco-friendly cooling tips helpful. Check back for part two of our blog to learn even more beneficial tips to help reduce your energy costs while keeping your home nice and cool. And as always, please call our HVAC professionals for any HVAC services or repairs, as we are always here to help you.